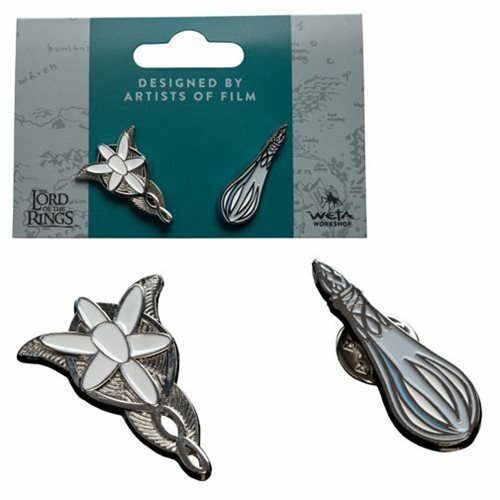 Designed by artists of film, this Lord of the Rings Evenstar and Galadiel's Phial Collectible Pin Set is the perfect Middle-Earth accent to your look! This pin set is made from brass metal with enamel paint detailing. Each pin measures approximately 1-inches long x 3/4-inches tall and comes mounted on a backing card inside a plastic bag. Begin your collection of Middle Earth keepsakes with Lord of the Rings Evenstar and Galadiel's Phial Collectible Pin Set!